Generation Y also called the millennials is the one who is dominating the workers’ group. Gen Y is our new breed ready to take the world head on by starting their career in different fields and there are jobs where you can find the majority of Gen Y working. The Gen Y group or generation millennials age range is 22-36 and working from manager to sales worker. 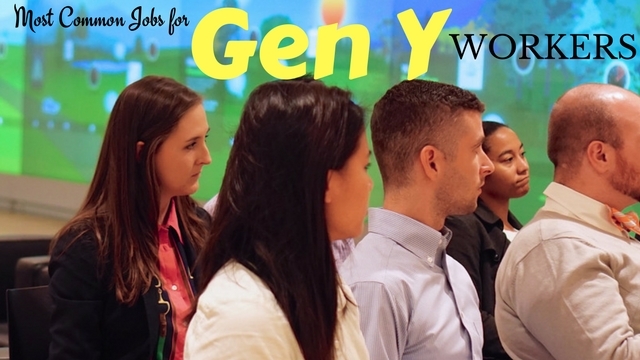 In this article we are going to discuss most common jobs for Gen Y workers, read this article if you belong to the Gen Y group or want to gather information about your successor group who are the in-charge now. Gen Y does all sorts of jobs, but there are few jobs where you can find the highest number of workers belonging to Gen Y but the big question, for now, is what Gen Y is? When the World War II ended and people started to reform their lives, the concept of generations came to the life based on the improvements, innovations and the changes people accepted in their life as well as the changes made for new generations. There are no specified rules to divide the years for a generation, but generally, it is done according to the major changes occurring in human life for better or worst. Gen Y basically is the successor of Gen X and Gen X is the successor of Baby Boomers. Generation Baby boomers are born after the World War II and the Gen X born between the years 1963-1980. Gen Y came after the Gen X when the world was going through major changes and new innovations, the people born between the years 1981-1994 come under Gen Y. One of the important factors that help in classifying the generations is innovations Jobs. Jobs play an important role as job and employment change with the generations and affect the human race. We are discussing most common jobs for Gen Y workers. There are jobs that are common among one generation because the job is one factor that changes from generation to generation. When we discuss Gen Y and common jobs for Gen Y workers, there are few who fall under this category. Merchandise display is one of the jobs that are common among Gen Y workers. Gen Y workers have a creative mind and they love to showcase their knowledge to the mass of people. Merchandise Displayers create innovative, fascinating and attractive displays to showcase different merchandise including all sorts of clothes and other accessories. The market of merchandise display is big and demanding to be fresh and new ideas are welcomed as well as latest technological approach. Gen Y has a full understanding of latest technology, as well as more compatible working with technology and new ideas. Merchandise display’s jobs include a heap of work, coordination, and technological understanding with the creative and young mind. The sales representatives are another common field between Gen Y workers. Sales representatives are those people who directly interact with the consumer, understand their needs and give feedback to the organization and the manufacturing unit so that they can make the product, consumer want. Sales representative are the most reliable source of information between company and consumers. They are important for both consumer and manufacturer because they help in manufacturing by telling the needs of the customers and consumers get the product they are looking for. There are various sub-posts of sales representatives and on a different level in a different organization which provides a secure job for Gen Y workers. Gen Y worker chooses to be sales representative more often than any other profession. Another common job for Gen Y workers, but hardly appreciated by many people because we still think that the job of the server is the lower step of the ladder of class and society. Although education was easy for the Gen Y and they got an education at a lower price with less competition compared to now, but Gen Y was ignorant of the opportunities they got. The job of server entails serving food drinks to the customer in a restaurant, food court, club or a hotel. Servers are responsible for satisfying the customers and their responsibility is to take care of every need of the customer. The status of the job depends on the status of the restaurant they are working in as well as their income because the server working in five-star hotels have higher status, income, and educational qualification compared to a server who works in a local restaurant. Well, the job of a manager is demanding, but they get a good amount as a pay compared to any other job. Managing is another common job for Gen Y because controlling is the habit most people from Gen Y got. They love the control, feeling of power and ultimate control of the situation because they were born at the time when the last generation was surrendering control to the new one and innovations were as common as the internet today. The job of manager consists of controlling and administrating group of people or an organization. The job of a manager can be a bit nerving and challenging as they have many responsibilities and controls as well as they are the one who directly answers to higher command of the organization. Well, the people who belong to Gen Y group range from fresh graduates to fully employed workers. Being interns is not the job but an opportunity from the employer to the potential employee so that they can learn and develop skills for the job at a low price. A fresh graduate, student or undergraduate who starts working in a company for a limited period of time is called internship and the person perusing internship is called an intern. It is not a real job, but because most of Gen Y are still fresh out of college or school, so it is another common job for Gen Y employees. An internship is the first step toward a successful career where you learn the mechanics of the business world as well as use the knowledge you gain from school and college. The pay for interns are hardly enough for survival, but as intern usually get help from parents so that’s fine because they are getting paid for learning. Sales associates are the people you first interact when you go to the retail shop; they answer all your queries and basically sell their product by pointing out good about the product. Sales associate jobs are usually common for Gen Y workers because they know how to bargain and manipulate people to hear them. Sales associate’s job is very important for the retail industry as you cannot imagine the retail world without sales associate. Sales associates are the people who interacts with the ultimate consumer and lead them to the product they want and company’s product. Gen Y people are an excellent persuasive person and they belong to the generation who do convince other for their mutual benefits. People who belong to Gen Y are generally young with fresh ideas and energy. They do what they love, they can be happy with the job of the server or they can be the owner. Being owner is one of the common jobs for Gen Y as they love to be in charge as well as already established organizations are having difficulties in hiring them. The people belonging to Gen Y are in their prime age between 22 to 36, a perfect age to start their own business venture, take the rein on their own hand, because Gen Y loves the control they have over the situation. Lots of Gen Y worker chooses to be the owner of their own business and choose entrepreneurship as their common job. You can easily see the number of small businesses around you are managed by young adults. The nature of business hardly matters, it can be a shop or boutique or a software solution company. The thing that matters the most is Gen Y choosing ownership rather than a job career with famous companies. You can often see a young adult behind the cash counter. Actually, the Gen Y love to be self-dependent because that makes them feel powerful, in control. They do not hesitate from the jobs like cashier jobs or server because ultimately these jobs pay their bills. Globalization has changed many things for Gen Y and one of them is working all sorts of jobs without hesitation. Being a cashier is a common job for Gen Y workers, there are various reasons they opt for this job but nonetheless, they do this job. The job of a cashier is to collect the money for the product consumer buys from the shop or shopping complex and keep records of sales; a cashier also works with banks, institutions and other places where money involves. Teachers are those people who change our life for better and help us to stand on our own feet. People who belongs to Gen Y loves to teach others and make a difference in other people’s life, but they are not keen on teaching adults because of their less age difference. Teaching jobs is one of the noble profession and one of the common jobs for Gen Y workers. Gen Y is techno savvy, love to do multitask as well as believe in life outside the work and these are some of the reasons why they choose teaching as a profession because teaching allows them breathing space for so many things other than work. Gen Y workers are great teachers for Gen Z and Alpha because they have a better understanding of changed scenario, technology brings in our life. Once again we are stating that Gen Y loves the control they have over their situations and over other people. They do many things together and find a different and easy way to complete the task which makes them supervisor material. Gen Y is more coordinating with what they want, what they have and what they want to achieve, technology helps them in finding their own ways. The Supervisor is one of the most common jobs for Gen Y workers because they do well when they have control over the situation. Doesn’t matter how hard it is, they are great leaders and that make them choose the job that provides ultimate control of someone, something. Assistants are the person who work under a senior authority and manage their work schedules, appointments, files and other stuff. Assistants are one of the common jobs for Gen Y workers because they are very keen on learning and do well in multitasking. Gen Y has learned to accept change with a fast pace as well manage to multitask by adapting changes, world had thrown their way during their year when they were growing up and that make them best assistant material. Gen Y as an assistant are reliable, organized and know what they are doing. Gen Y chooses this field because this is the only field that offer a great way to learn from someone experienced and high on the ladder of success. Gen Y is the generation who had grown up in the time when lots of things have changed in the span of a few years, they are accustomed to changes and learn very fast. There are many misconceptions about the Gen Y because they do not walk over a predefined path but make their own way. The most common jobs for Gen Y worker shows how diverse they are and how open-minded they live. In this article, we had discussed the common jobs for Gen Y and we hope this article really helps you.